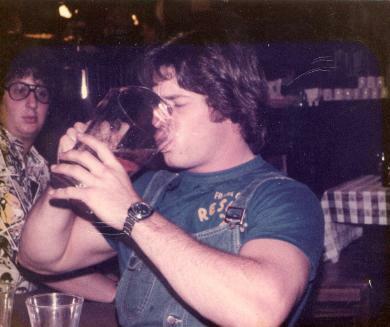 "...June 22, 1977 in Carlisle, Pennsylvania"
Steven Petrosino (Lt. Col. USMC Retired) drank 1 liter of beer (33 ounces) in 1.3 seconds on June 22, 1977 at the Gingerbreadman in Carlise, PA, a 56% improvement over the previous world record set several years earlier by Peter Dowdeswell of England (2.3 seconds for 1 liter). This web page will chronicle the world record established in 1977 and first recorded in the 1978 edition of the Guinness Book of World Records. This record remained undefeated for 14 years, and became a permanent record when Guinness removed all records for beer drinking or alcohol consumption from their record book in 1991. Seventeen years later, In 2008, the records reappeared in the Guinness Book in the "Gross Gastronomy" section. As of August, 2009 (the last update of this website), this record remains undefeated. All other claims to a world beer drinking record by anyone else are spurious. The night of June 22, 1977. Establishing the World Record. The Guinness World Record was established at the Gingerbreadman bar in Carlisle Pennsylvania (near Dickinson University and the Carlisle War College) where Petrosino was working as a bartender while attending post-graduate school at Penn State University. Petrosino was 25 years old at the time. Time Keepers used three digital watches which had just become commercially available in the United States in early 1977 and cost over $125 each. The time keepers were: Michael A. Barber, Joseph Casserta, and Leo Sweeney. Leo was a representative for Guinness, Ltd. Times of the three timekeepers were averaged to arrive at the official time reported to Guinness. 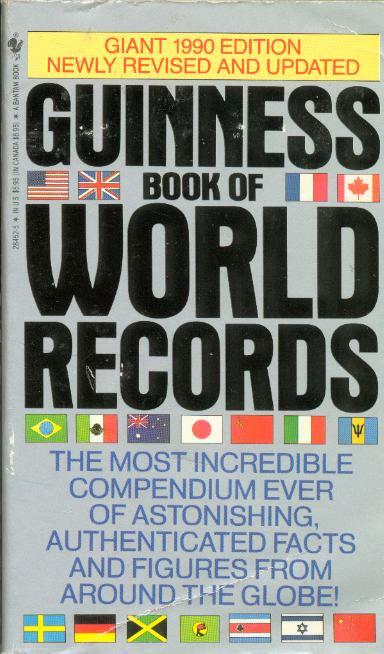 The record was established for 1/4 liter (0.137 seconds), 1/2 liter (0.4 seconds), and 1 liter of beer (1.3 seconds), but only the 1 liter record was published by Guinness. Picture 1: 1/2 Liter of beer (2 8.5 ounce glasses) in 0.4 seconds. Picture 2: Notarizing the signatures of 35 witnesses. Picture 3: 1/4 Liter of beer (8.5 ounces) in 0.137 seconds. Picture 4: Posing for picture after consuming 4 pitchers of beer. The speed drink video recorded directly above was conducted over 26 years after establishing the world beer drinking record on December 18, 2003 at the Old Bag of Nails Pub in Columbus, Ohio. The speed drink was conducted using a 12-ounce mug and was timed at 0.18 seconds, which is about 0.043 seconds slower than the original world record set in 1977. The other videos above were also recorded using a 12-ounce mug (filled with about 11 ounces of beer, or 1/3 liter). They were recorded 33 and 37 years respectively after setting the world record. There is no existing video of the original record (it would have had to have been done using 8mm video tape) but several newspaper articles and still photographs exist, some of which are displayed above. - - - - - - - - Jump to Page - - - - - - - - Nutrition Advisor Home PageCalorad for weightloss Calorad® for weightloss- Frequently asked questions Calorad® Calorad® - Product history Calorad® - Testimonials Calorad® - More Testimonials Immunocal® - for Immune FunctionGlutathione - Get a FREE report on the most important antioxidant you never heard of! This website was originally Established on June 11, 2004.